In the far West of Cornwall legends abound. By Gordon Frickers 47 x 62 cm (18½” x 24½”), ex studio, ex frame, available, £1,200. 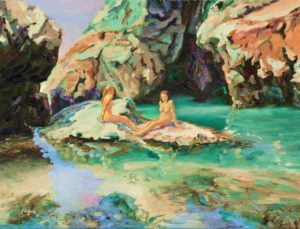 Mermaids Pool, magical, can only be reached at half tide on calm days when it will reward your visit most generously with its steep, green granite, suntrap cliffs, sun table rock and undersea gardens. The whole Lizard area is well worth a visit. I love it, the Lizard Point most southerly of Britain, nearby Cadgwith Cove and certainly (my favourite) Kynance Cove. There is though much more to discover. One can spend days exploring, walking, sun bathing there. Don’t miss Mermaid’s Pool, only accessable at half tide via Queen’s Pool, and swimming underwater in the ‘garden’. Let a little of it’s vitality enter you and nourish your soul via this painting.